Strategy, memory and anticipating the next moves of your opponents...These are the hallmarks of Mahjong, a game that originated in China but has since spread throughout the world and has even morphed into different variations. Anyone can learn how to play Mahjong, and it offers great benefits to those who take up the challenge. Here’s a look at the history of Mahjong and why it can be a very beneficial game to play. The game of Mahjong originated in China although experts still debate when exactly the game was created. Some say it was more than 2,500 years ago, and was created by Confucius. The famous philosopher had a passion for birds, and many believe that the clacking of the tiles when they are shuffled is reminiscent of the chirping of sparrows. However, most experts believe that the Mahjong we know today was developed in the late 19th century and actually evolved from many similar, earlier games. Mahjong grew in popularity in China as more people were introduced to the game. Travelers brought it from province to province, eventually taking it beyond China’s borders and spreading it through Japan, South Korea and Southeastern Asia. In 1920, an American named Joseph Babcock who was working in China for an oil company brought the game to the U.S. and published a set of rules - no written rules existed in China at the time. Soon game companies like Milton Bradley created game sets and interest in Mahjong began to grow in the U.S. The most common version of Mahjong is played with 144 tiles that are based on Chinese symbols and characters. Each player is dealt 13 tiles and then draws and discards their tiles until they can create a set and a pair. There are different types of tiles - those with numbers (also known as “simples” or dots, bamboo and characters), “honors” tiles (winds and dragons) and “bonus” tiles (flower and season). Players attempt to collect combinations of the tiles, and these combinations are referred to as Chows, Pungs and Kongs. There are specific rules that govern how and when tiles can be discarded and what comprises pairs and sets. The game also has a special scoring system that determines the winner. The overall object of the game is to make a complete hand of 14 tiles - this is called “going Mahjong”. The game of Mahjong encourages the use of strategy and requires a degree of risk taking as well as the ability to anticipate your opponent’s next moves. This type of game can help participants remain mentally sharp, make quicker decisions, analyze situations quickly and develop more patience. 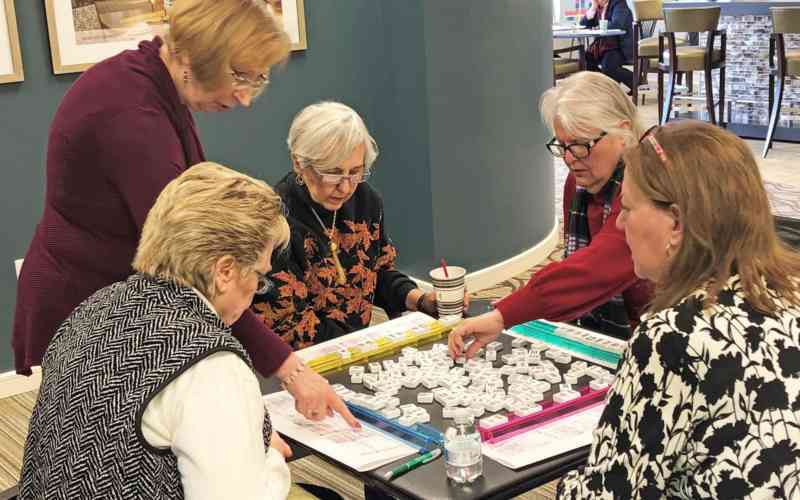 In addition, Mahjong is a fun game to play and provides an opportunity to build new social connections. Anyone can learn to play Mahjong. Classes are offered every Wednesday throughout the month of January at the Echo Lake Welcome Center in Malvern. No prior experience or knowledge is necessary. Contact us to RSVP or to learn more about the Echo Lake 55+ community located in picturesque Atwater.